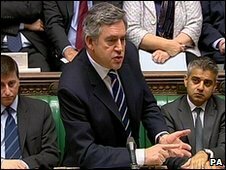 The Conservatives have called on Gordon Brown to apologise for "misleading" MPs on the recession after heated exchanges at prime minister's questions. Asked whether the UK was the only one of the G20 group of leading economies still in recession, Mr Brown said that Spain's economy was also contracting. The Tories said it was "simply not true" Spain was in the G20 and urged the PM to correct the "inaccuracy". No 10 said that Spain had attended G20 meetings in the past. Spain is not listed as a G20 member on the organisation's website and the Treasury referred questions on the subject to No 10. The row began when Conservative leader David Cameron challenged Mr Brown to acknowledge recent reports he said showed the UK was the only leading world economy still in recession. Among the G20 group of leading industrialised nations - regarded as the most powerful international economic forum - the UK was the only one not to have returned to growth, Mr Cameron said. Mr Brown denied this. "No they don't confirm that," he said. "Spain is a member of the G20 now and it is in recession now." Spain is not officially a member of the G20 although it has been invited to attend key meetings, including the London summit on global economic recovery earlier this year. But the Conservatives said Mr Brown had made a mistake and should correct it as soon as possible. "When faced with a simple and direct question, you chose to mislead the House of Commons by stating that Spain is in the G20," said Philip Hammond, shadow chief secretary to the Treasury. Mr Hammond noted that the Conservative leader, himself, apologised on Monday for getting his facts wrong over government funding for schools with alleged links to an Islamic group. "I trust that you [Mr Brown] too will take the earliest opportunity on the floor of the House to apologise and amend the record," he added. The US, France and Germany are among members of the G20 to return to growth in recent months. The chancellor has said he expects the UK to emerge out of recession at "the turn of the year". In the Commons, Mr Cameron said Mr Brown's claim that the UK was "leading the world" out of recession had been proved completely wrong and Britain was actually being "left behind". "The fact is it that it his policies which have given us the longest and deepest recession in our history," he said. But Mr Brown said the Tories had opposed a string of Labour policies that would help to shorten the recession, including bank rescues, the fiscal stimulus and support for jobs and mortgage holders. "They have been wrong on the recession. They will be wrong on the recovery," he said. Attacking Mr Cameron's personal economic philosophy, he added: "The voice may be that of a modern public relations man. The mindset is that of the 1930s." He also attacked the Conservatives' plans to increase the inheritance tax threshold, saying it appeared to have been drawn up "on the playing fields of Eton". The clash came a week before the government's pre-Budget report, the last before next year's election.